Dutchess County New York and it’s largest city, Poughkeepsie, New York combine the best of both worlds; beautiful farms and rural areas and the bustle of the urban Poughkeepsie. Yet both places share one thing in common—the danger posed by asbestos. In any home, farm or commercial property built before 1978, it is almost a certainty that it will contain asbestos and that hazardous material must be removed immediately. We have been handling asbestos removal and asbestos abatement in Poughkeepsie and Dutchess County, NY for more than 25 years. It seemed, until the late 1970’s, that asbestos was the perfect building material, being strong and fire-resistant, so it was put into asbestos siding and roof shingles, asbestos plaster and sheetrock, flooring tiles, insulation and even those popcorn ceilings found in so many basements and office buildings. No one knew that as the buildings aged and the materials degraded, they would release invisible asbestos fibers that would find their way into the lungs of those buildings’ occupants, causing cancer, Mesothelioma, pneumonia and asbestosis. 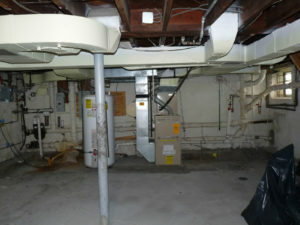 In order to stave off such dire health risks, the asbestos has to be detected and removed. We send in an independent testing firm to sample the air and, if asbestos is found, our certified, licensed and insured crew goes right to work. They seal off the contaminated area and use negative air machines to ensure than no further asbestos fibers escape into the air. Then the asbestos is scraped, bagged and disposed off off-site. Abatement begins with any area exposed during removal being resealed with shellac and the surrounding area thoroughly cleaned with specialized equipment. Then the air is retested. If no asbestos if found, only then do we sign off on the job and allow your tenants, employees or family back into the site that we now know is safe. In Dutchess County, NY and Poughkeepsie, NY, for asbestos removal and abatement services, call (877) 645-1428.